While studying abroad is one of the suitable opportunities for foreign language (L2) learners to develop their proficiency in the target language, the mere experience of living in a foreign environment does not necessarily help students to become proficient L2 speakers. It has been argued that interaction with other people can enhance study abroad students' personal growth and their proficiency with language skills and communicative competence. 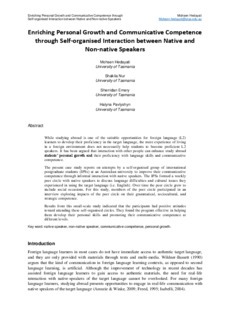 The present case study reports on attempts by a self-organised group of international postgraduate students (IPSs) at an Australian university to improve their communicative competence through informal interaction with native speakers. The IPSs formed a weekly peer circle with native speakers to discuss language difficulties and cultural issues they experienced in using the target language (i.e. English). Over time the peer circle grew to include social occasions. For this study, members of the peer circle participated in an interview exploring impacts of the peer circle on their grammatical, sociocultural, and strategic competence. Results from this small-scale study indicated that the participants had positive attitudes toward attending these self-organised circles. They found the program effective in helping them develop their personal skills and promoting their communicative competence at different levels.